This is only my fourth sighting of a monarch this year. I cannot believe how low the numbers are this year on Long Island. This one is roughly half the size of a mature monarch, so at the very least there are some laying eggs in my area. I saw a baby dragonfly yesterday. It was very much enjoying my California Lilac. I watched for a while but didn't have my camera on me. I'm assuming it was a baby dragonfly because it looked just like an adult dragonfly only smaller. It was a shimmery blue color. I hardly ever see dragonflies so it is a big deal for me to see one in my yard. BirdLover wrote: I saw a baby dragonfly yesterday. It was very much enjoying my California Lilac. I watched for a while but didn't have my camera on me. I'm assuming it was a baby dragonfly because it looked just like an adult dragonfly only smaller. It was a shimmery blue color. I hardly ever see dragonflies so it is a big deal for me to see one in my yard. We have pint size ones here also. Couldn't tell you what their proper name is tho. This guy has, what I think is a gnat, just to give you an idea of how small they really are. As in every gardening season, I'm enjoying the Song Sparrows here. I'm pleased that native birds can fit into human landscapes. Fit in when they are confronted with invasive bird species. Doesn't always happen. The Collared Doves showed up here on their invasion of the continent, just a few years ago. (I'm olde enuf to remember seeing the first Starlings.) I have worried about our native Mourning Dove. Would it survive? Retreat? I think it's doing okay ... I see them often. My first thought is usually "Robin!" They are quite a bit smaller than the Collared Dove. Look again ... nope, Mourning Dove. I love the Song Sparrows! They are prominent winter birds here and I see and hear them a lot in spring. They seem to think the garden gate honeysuckle arbor is an ideal place to sing, and its right outside the bedroom window. I cant remember if they migrate away but they always return in flock with White-throated Sparrows. 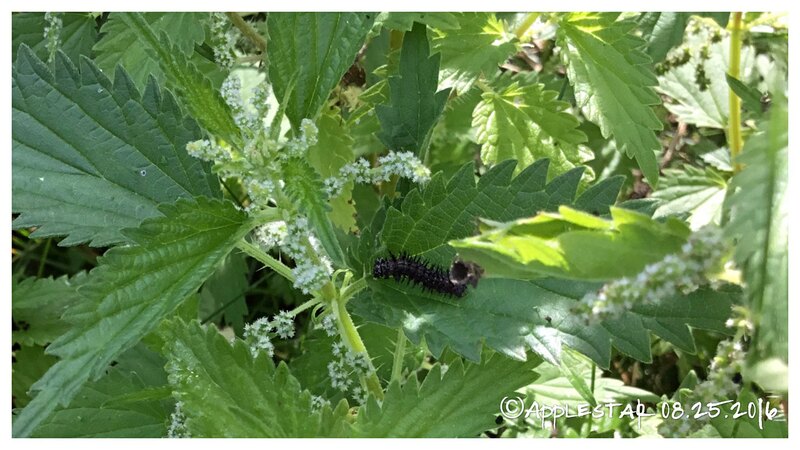 I spotted a new-to-me caterpillar on the raspberry. At first sight thought it might be an Io moth caterpillar that came over from the Baptista to the left, and considered catching it and raising it so we can see it eclose, but I wasn't sure, so I left it alone. This beautiful smeared dagger moth caterpillar was hanging out on a reed beside the boardwalk that goes through Volo bog. This is another of those relatively few caterpillars in America which have a common name - the smartweed caterpillar. The name is only somewhat appropriate, since it eats many different types of plants and not just smartweed. [...] In all cases they have an interrupted yellow stripe below white spiracles, and a few very long hairs sticking out from the head and the tail. ...so GLAD I decided NOT to weed out the Smartweed in the backyard. Birds like the flowers and seeds, too, so this is a win-win. Ha! Finally got the pictures from my new phone to my computer! my milkweed plant is just covered in orange aphids. oh my gosh! of course i can find on the internet ways of getting rid of them. but i thought i would come here and ask if anyone has this problem and what did they do that was successful. this is my first year with milkweeds and i have planted them everywhere in my yard. 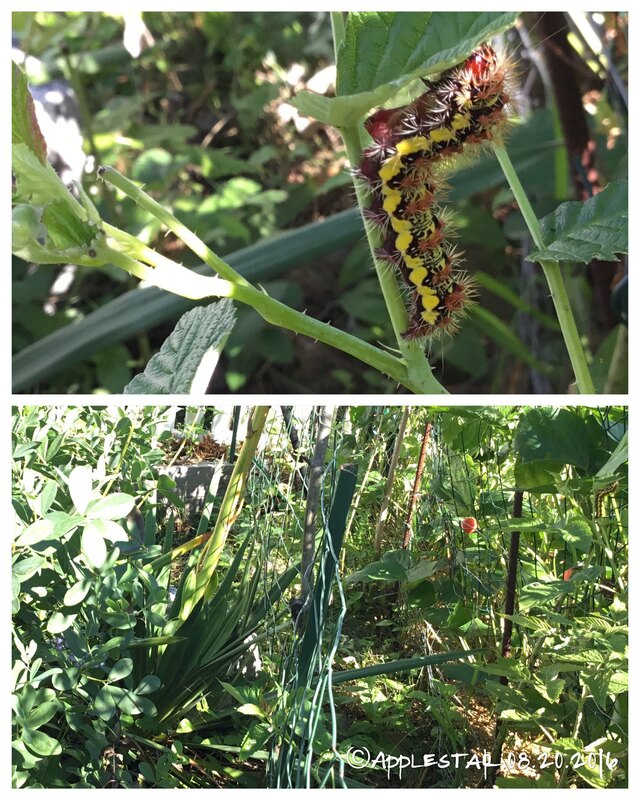 i do have a couple caterpillars but i worry that these little creatures will win this war. Be patient. If you have ladybugs or lacewings around they will find your aphid colony and eliminate it. 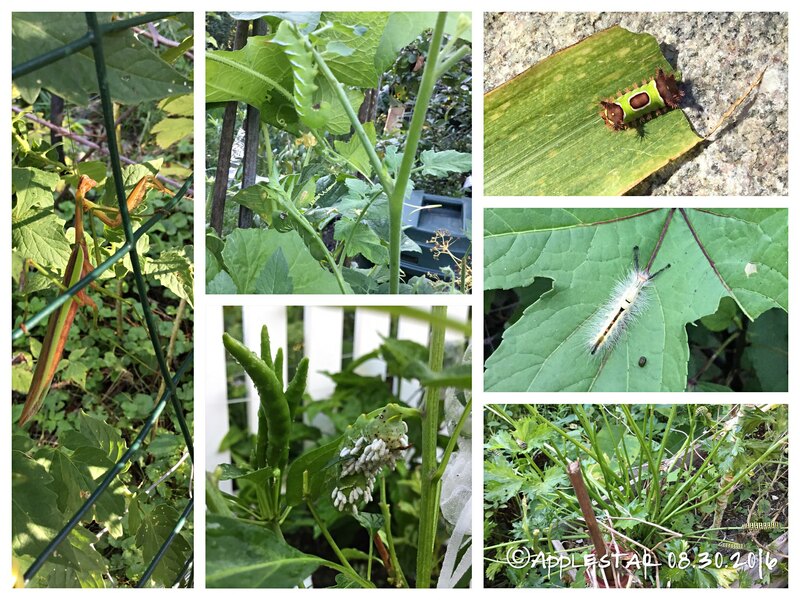 The aphids most likely won't harm the milkweed and any pest control option might kill off ladybug and lacewing larvae. If you absolutely must thin the population then check to make sure there are no lacewing or ladybug larvae in the group then carefully squish the aphids with your fingers. You can wear rubber gloves if the thought of having bug guts on your fingers is one you can't stand. Another mantis, this one hanging over the hummingbird feeder. There is no danger of this kind eating hummingbirds, they are just way too small for such large prey. It was most likely looking for ants or flies. And yes, despite what I've read on the internet this species of mantis does eat ants. I've seen them doing it before.